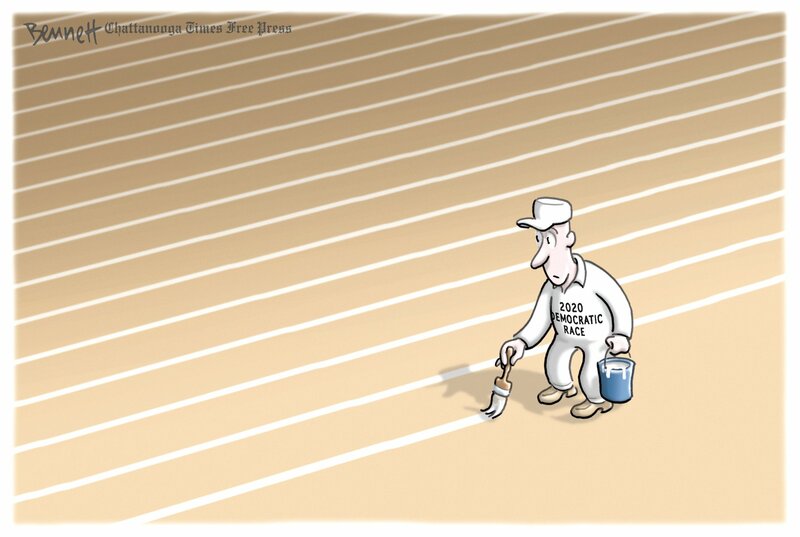 Clay Bennett has a refreshingly neutral commentary on the number of Democratic candidates lining up for the 2020 Presidential race. It’s a lot of lanes, but at least the groundskeeper is keeping them even, which is more than I’m seeing elsewhere, in both cartoons and social media commentary. Someone was trashing Kristen Gillibrand on Twitter, for instance, because when some gathering served fried chicken, she began to use a knife and fork before deciding to go ahead and pick up the pieces. I looked it up and Emily Post does indeed say go ahead and pick it up, but I’ve certainly seen people at dinners cut off the larger pieces rather than slop the greasy skin off on the front of their good clothes. But I can’t imagine having a President who used cutlery with fried chicken! Though, of course, we must have towelettes to wipe the grease from Pilate’s fingers before he signs a paper to invade Iran or outlaw a woman’s right to control her body. Meanwhile, we can’t vote for Kamala Harris because when she was attorney general, people in California went to jail, and we can’t vote for Amy Klobuchar because she’s a mean boss. I never heard a male candidate ruled out for being a tough guy, by the way. I’ve worked for a large number of women in my time, and, while I like the way they seem to listen more, I preferred the ones who were decisive and solid and if that’s mean, well, nice guys finish last and so do nice girls. I did get a laugh out of Jack Ohman‘s depiction of Klobuchar’s announcement, because I’d been seeing some headlines that said she announced in a “blizzard,” mostly from places that have never seen blizzards. I went to the Minnesota media to see how they covered it, and they did make something of the snow, but it was only five inches and most of their coverage was about how little that discouraged anyone. I’m not saying I’d vote for her because she’s a strict boss who isn’t afraid of a little snow, but at least we could be relatively sure that she wouldn’t pull a William Henry Harrison on us. 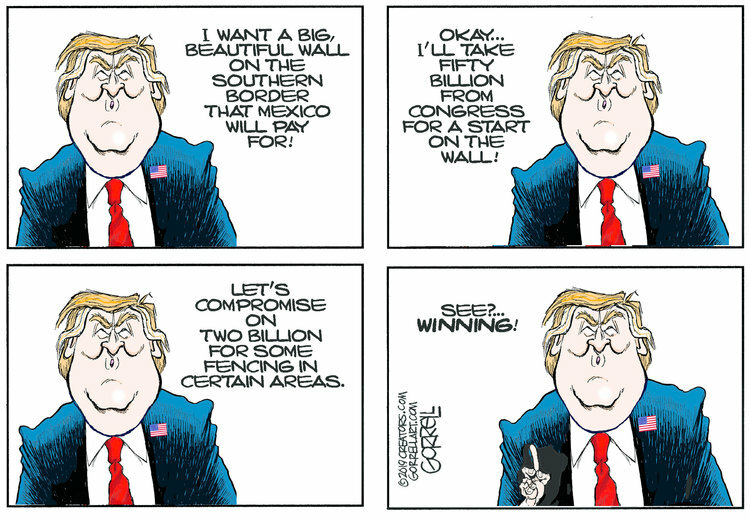 Nor, as some have already pointed out, would she cancel a speech to honor veterans because it was drizzling, and the Donald Trump Reality Show continues to lose ratings as he continues to lose credibility, with Bob Gorrell pointing out the way Dear Leader spins his broken promises. Most Presidents have no problem talking about compromise, but the one promise Trump has kept is the one of dividing the country. However, despite Trumpian boasts and loyalist estimates, it’s hard for any but the True Believers to accept that Dear Leader’s group last night was larger than O’Rourke’s. And so, while honest conservatives like Gorrell take note of the President’s shortfalls, the more hardline rightwingers go off on tangents, purposely misinterpreting what “late term abortion” is, or repeating Trump’s absurd Red Scare nonsense. Mike Smith takes on that latter foolishness, pointing out ways in which socialism is already part of our system, but I think the next round of elections may, indeed, hinge upon the Republicans’ ability to conflate socialism with communism. And their ability to get us all scared to death of Commies while embracing Dear Leader’s bromance with Vladimir Putin. Matt Davies notes an economic shift that may also play a major role in the coming elections, if the victims of this cruel change can harness generational anger into action. That is, anger and finger-pointing are divisive and tend to distract from the sort of analysis that could fix, or at least ameliorate, the problem. Fifty years ago, college graduates found themselves in a world of “you can’t get a job without experience and you can’t get experience without a job.” That’s not new. And mortgage rates a generation ago were in double figures. 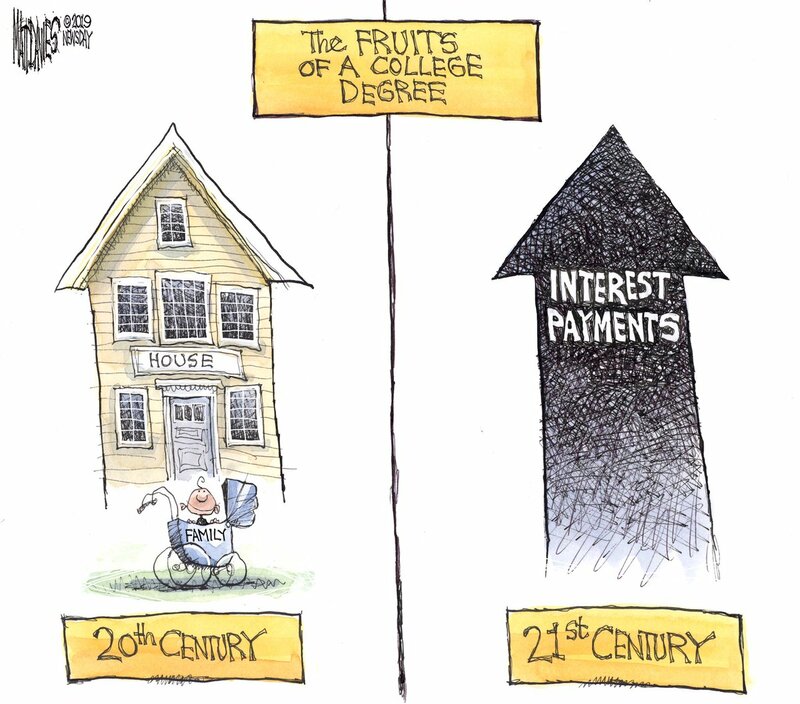 What is new is, first of all, that there are far more job categories in which a college degree is required, and, second, the cost of that degree has skyrocketed, not just because of rising tuition but because of support that has not risen with it. In New York State, for instance, top students in my class could qualify for Regents Scholarships that would pay your tuition at any state university and would make a good hole in your bill at a private school in-state. Today, that stipend may not pay for your books. Other states offer even less, then whine about their kids moving away. But, if my own observations are any key, Post-Millennials aren’t buying the idea that you have to go to college, or, at least, that you have to go right out of high school. And they’re also listening to those scary, scary socialists who suggest that, if our business world is going to require a K-16 educational system, we’ve got to pay for those last four years the way we pay for the first 13. That’s not a benefit for individual students. It’s an investment in the future of our nation, it’s common sense, and it’s a message being carried by the candidates of the future. Those candidates are going to start winning elections. Jimmy Johnson and I could cheerfully sit by the fire and tell stories of the Good Old Days, among which I would put Lincoln’s Birthday, which was never a federal holiday but which we got out of school for. The fact that it was only a state holiday makes it unclear why we had to change “Washington’s Birthday” to “President’s Day” in 1971, when we shifted our holidays to Mondays, and you’ll note that nobody mentions anyone but Washington and Lincoln in their advertisements. We know that “President’s Day” is just a mash-up of Washington’s Birthday and Lincoln’s Birthday, or, at least, some of us do. Because you can’t fool all of the people all of the time. Every year on Lincoln’s birthday it always brings to mind that Abe was born on the same day, on the same year (within hours) with Charles Darwin. It boggles my mind that perhaps the two most important men if the 19th Century were born on the same day. Amy Klobuchar could probably make an appearance at a memorial program in a French cemetery in the rain, too. Apologies for my comment – I missed the fact that Mike said the same thing because I didn’t read the fine print. Somebody – it may have been the Senator herself – made a crack about the cold hurting his heel spurs. We still celebrate Washington’s Birthday- that’s the official title of the Federal holiday on the third Monday of February even though Washington’s actual birthdate never falls of the third Monday.